This weekend friends and I checked out Vinoteca’s back patio (11th and U), which opened earlier this summer. The back patio boasts a bocce court and a more old European vibe than the modern, stark decor inside. We took advantage of Vinoteca’s 5-7 pm happy hour that’s good all week long. 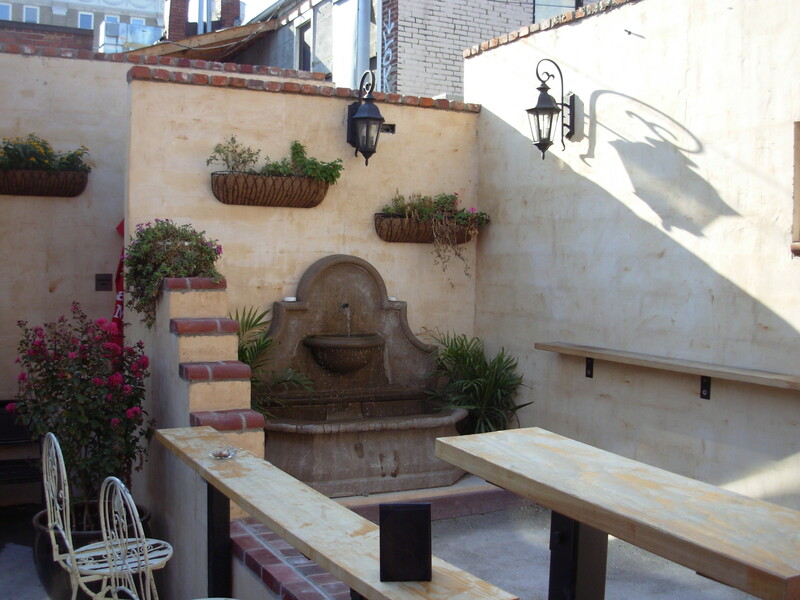 They also have some food specials for the patio: sliders, fingerling potatoes, ricotta flatbread, and some sandwiches. The food, like inside the restaurant, I found to be hit or miss. 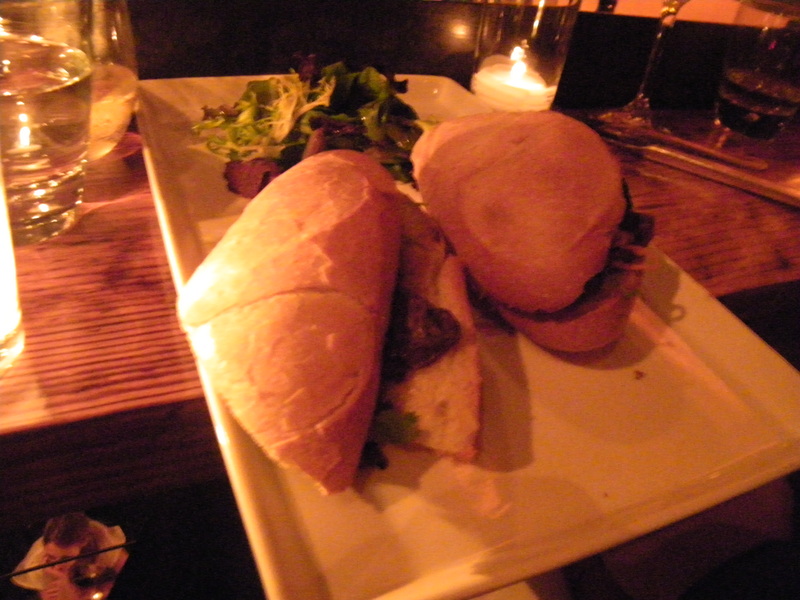 We really enjoyed our lamb sliders but our friends found the bison sandwich unremarkable. The vibe on a Saturday afternoon was pretty relaxed, but I wasn’t a fan of the kind of Euro-club music playing – it didn’t really match the decor or atmosphere I see with a bocce court. Otherwise, it was a nice place to hang out when the weather is great, and I can imagine returning now that it’s getting cooler. 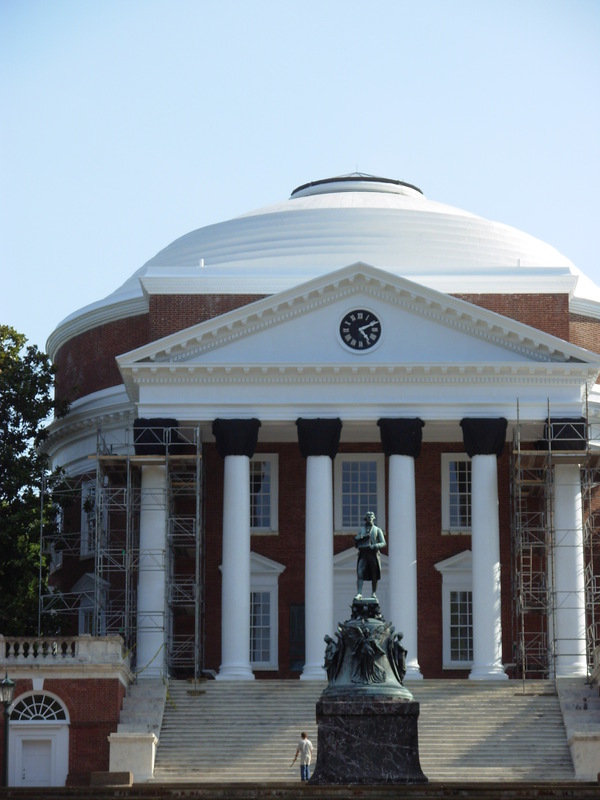 To see: UVA’s campus. It was fun pretending I was still in college walking around the campus with great buildings and views of the mountains. My favorite are the old residence halls that have rooms that all open to the quad (yes Edgar Allen Poe lived in one of them). The downtown mall area has a lot of cute bookstores, antique stores, and restaurants. The restaurants are a bit overpriced but the stores are super cute. Some of my favorites were Oyster House Antiques, Blue Whale Books, Sidetracks Music, and Timberlake’s: an old school fountain shop/drug store. If you’re there on Friday do Fridays after Five on the mall, live music, sitting outside: good combination. Oh and um, Monticello. Go there too. raved about it, for good reason: $30 gets you 3 courses and one of my favorite dishes of the year so far: tomato sushi. A smoked tomato acts as the “raw fish” with oh so creamy mozzarella as the “rice” and balsamic reduction as the soy sauce. Oh man. Go. Also enjoyed Boylan Heights – gourmet burgers for around $8 and a collegiate bar atmosphere (it’s right across the street from UVA). To drink: You gotta go to the wineries. Everyone raved about Stone Mountain Vineyards, but the drive up a mountain on a narrow, dirt road made me too nervous. I really enjoyed Barboursville – $5 gets you a wine glass to keep and 19 wines to taste. The owners are Italian winemakers and they grow some great Italian vintages. Plus there’s ruins on the site: Governor Barbour’s Jefferson-designed mansion burned down in the 1800s and is on site. Very cool. You can view more photos from my trip on Flickr. 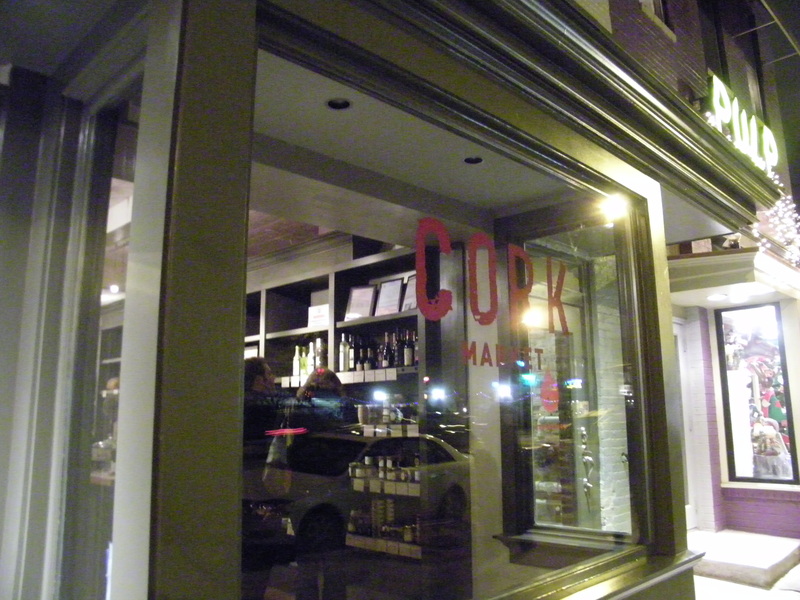 Last night I was invited to a media preview of Cork & Fork, opening Saturday at 14th and Church. I have to say, I wasn’t really expecting much (so close to and similar to Cork Market), but I left really impressed. The store will have wines from the old world and new, as well as a pretty impressive selection of craft beers (they will be the only DC store to carry a beer crafted by Ferrian Adria of El Bulli). They will offer some cheeses, breads, snacks (and soon organic, local eggs). Ani told me that the “fork” really comes in the classes and events they do. What really impressed me is the Landragin’s passion for food and wine. The store is owned by a mother, father, and daughter who all really care about the quality and integrity of food and wine. I listened as the mother, Anna, told me how she learned to cook and how her philosophy on food evolved. We talked about the importance of seasonal, high quality ingredients. We talked about peasant cooking. She was a pleasure. The Landragin’s were open, warm, and highly knowledgeable. I can tell they bring that level of attention to their wine and food selections. The store will open on Saturday and they already have a pretty full calendar of events for May. Check back in on their website for more details. And thanks so much to the Landragins for having me! A friend texted me Friday morning, suggesting a foodie adventure. My response? Dickson Wine. I’ve heard such wonderful things about the food, I just had to go. We showed up at 7, only to find a bouncer/host letting us know that they weren’t even letting anyone in, but they’d take our number and it’d be 45 minutes. Promptly at 7:45, we were seated on the second floor on the bar/ledge. A downside: this bar must have only been 6 or 8 inches long, I was worried a plate would tilt and spill all over me… oh and there was the fact that the second floor bar space looked down on the first floor. A lady with a skirt or dress could easily expose herself more than she wanted to. 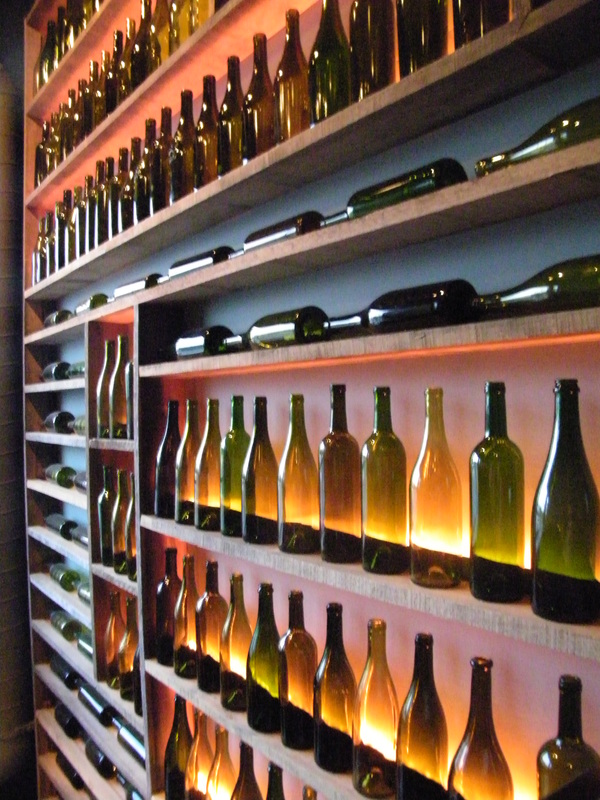 But, the scene is very cool, a wall decorated with empty wine bottles, 3 floors of tables – all communal. But let’s get to the food. We ordered the tuna crudo, duck prosciutto, bayley hazen blue cheese, the ribeye bahn mi, and the goat cheese and leek flatbread. I was a particular fan of the ribeye bahn mi (ah-mazing) and the goat cheese and leek flatbread. The charcuterie came with bread as well as mustard and apricot jam. The tuna crudo was good, though not great, but there was tons of it. The cheese and charcuterie selection was nicely edited, though I found out I’m not a fan of duck prosciutto, as nice as it sounds. Just too fatty for me. Now, onto the drinks. None of us were in the mood for wine – but we had some cocktails. The French 75, a classic, was good. The Cherry Pop (as recommended by We Love DC) was a bit strong but very nice – refreshing. I ordered the ginger ale because I’ve been trying to cut back on drinks – they had a really good Fever Tree ginger ale that was nicely spicy. We had the creme brulee trio for dessert, a nice small ending to a good meal. The most impressive thing, really, was the bill. While we didn’t order a bottle of wine, 3 of us ate for under $100. I was really expecting it to be at least $20 or $30 more than what it was. And the service? friendly, personable, speedy. So, first impressions? Pretty freaking good. I’ll definitely be back, but probably on a week day. And hopefully sitting at a table. This makes me believe that the wine/food store will be coming soon. 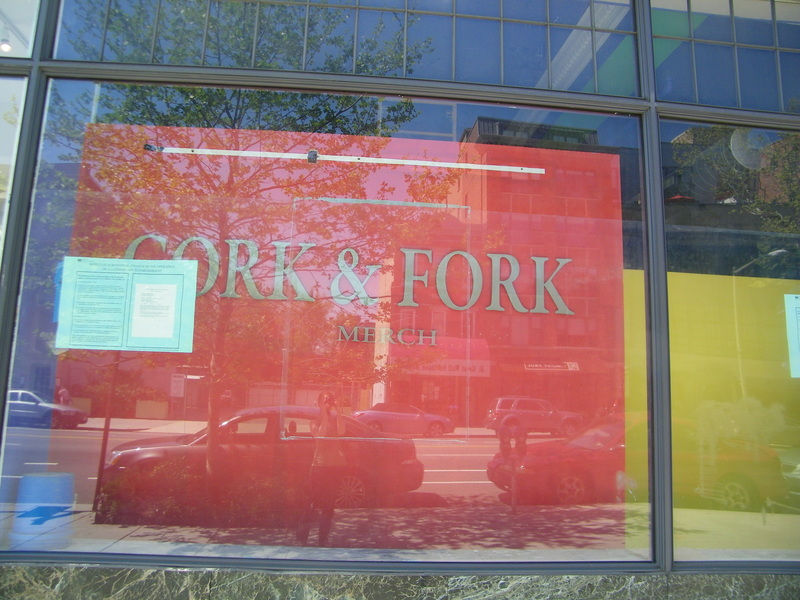 We heard about Cork & Fork coming back in July 0f 2009 and hoped to open in December, so I would hope that they open soon. I stopped by Cork Market after work today, leaving pretty impressed. They have wine of course: organized along the wall from white to red going from Austria to Spain (alphabetically I assume?) with New World in the middle of the store. There are also prepared foods, cheeses, meats, bread, crackers, Cork pastas, other assorted gourmet foods (truffle butter anyone? ), gelato, Copper Pot sauces (your friend Stefano from 14th and U’s market), and many more. ReadySetDC has photos of the inside. There were definitely different price points offered: more moderate-priced wines ($10 to $20) along with more pricey (the most expensive I saw was $95). Now there are definitely more wines at the higher price points, but I was glad to see the more affordable stuff. Same with the food, some of the food was on the pricier side, yet I left with a large container of egg salad with goat cheese, bacon, and chives for $4.50 and a decent amount of chorizo for $7. What I had was good, the egg salad was very good, and after having two pretty large servings of it, I have half left. Cork Market seems to be starting an interesting practice that some will probably find annoying: they take your name and phone number when they ring you up. The reason, they say, is so they can keep track of what you buy: say you can’t remember that amazing merlot you had – they have a record of it. Seems smart, but I can see how many people would dislike it. 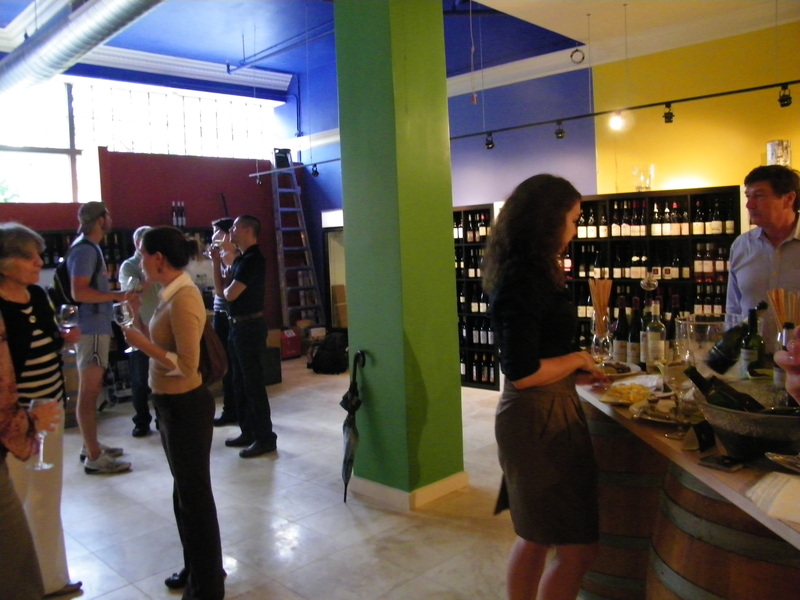 First impressions were good: high quality, nice variety of goods, decent selection of wine. Readers: if you’ve been in, what did you think? Robin Shuster, the lovely lady who runs the 14th and U farmers market, says Cork Market, at 14th and S, will be open on Monday or Tuesday. She got this news straight from co-owner Diane Gross. Unfortunately by that time I’ll be out of town, home in Massachusetts for Thanksgiving, so dear readers, I’m relying on you. If you see that they’re open, please email me (with any of your first impressions about the place) and I’ll post about it right here. I am super excited for it to be open. I might attempt to live there, drinking wine, eating charcuterie and cheese. And in other news, this is the last weekend for the season of the 14th and U farmers market – so get your market fill because they won’t be back until May!